Our sons have long since been paying for their own cars and insurance but when we got our annual automobile insurance bill this week, I could only wonder if we were still paying for their youthful vehicular indiscretions. My husband, Olof, was actually pretty sympathetic about some types of adolescent vehicle mishaps. As a college student, he remembers working as a delivery person for the father of one of his friends and backing the man’s vehicle into stationary objects not once but three times. 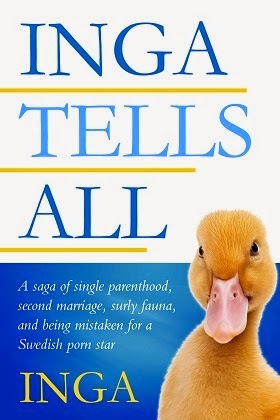 Finally the friend’s father, Mr. Knickrehm, took Olof aside and explained to him that he needed a better reverse strategy than backing up until he heard breaking glass. When our older son, Rory, was 17, Olof donated his VW Golf to him, teaching him how to drive its stick shift. For Rory’s inaugural solo drive with the car, we were treating Rory and 15-year-old Henry to dinner at the Mandarin House while we had a dinner party at home. We were not even through the cocktail hour when Rory called. As he attempted to get out of a tight parking place, he backed into a brand new red Lexus putting a pencil eraser-sized hole into its wrap-around fiberglass bumper. As anyone with a teenage son knows, you do not report these events to your insurance company, or you’ll be paying for that bumper 20 times over in higher insurance rates. Olof and I and Rory went to the man’s house the next day to survey the damage which frankly you needed a magnifying glass to see. But damage is damage, and we paid the owner for the repair. Rory tried to reimburse Olof from his summer job savings but Olof said he wanted to pay Mr. Knickrehm’s generosity forward. First backup incident was free. A year later, Henry got his driver’s license on his 16th birthday, and a mere two months later, got nailed for driving 20 miles over the speed limit on West Muirlands Drive by a policeman waiting for just such miscreants as our lead-footed son. Henry was outraged, insisting he was going to court and claiming entrapment. Olof, bemused, said he’d pay the fine if he could videotape the proceedings. Henry thought about that for a minute. “You don’t think that’s going to work,” he astutely observed. I don’t know if minors can have a lawyer plead them out of speeding offenses but regardless, it wasn’t happening at our house. Olof went with Henry to juvenile traffic court where they were subjected to a long wait and endless videos about the perils of speeding, drugs, etc. “I think this is part of the punishment,” Henry whispered to Olof. Henry got traffic school and a fine which in this case he had to pay. No first time free on moving violations. Fast forward a few years to the spring of Henry’s freshman year of college. He thinks he smells gas when he takes his car out for a quick errand one day, but it’s mid-term exam time; he’ll take the car in to be looked at next week when exams are over. So the car sits there for another week in the unseasonably warm April weather. Alas, when Henry next gets in the car and turns the key, the pool of gasoline that had been accumulating under the car explodes. As Olof pointed out to Henry later, he seemed to have forgotten that the root word for ignition is “ignite.” Fortunately Henry didn’t even try to grab his wallet and phone on the seat next to him, just leapt from the car as fast as he could. Within seconds the car was a fireball with flames forty feet in the air, setting off every car alarm in the parking lot. 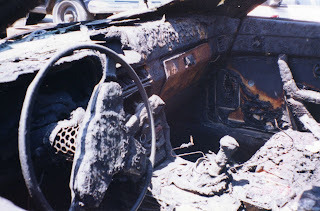 The flames torched the car parked next to his as well, never mind melted the asphalt. Freak would be an understatement. Obviously, the only important thing in this story was that Henry made it out alive. He was fine. Personally, I’m still recovering. Then, of course, there was the insurance claim. When we added the kids to our policy, who knew to even check whether it covered melted asphalt. Advice to parents: check melted asphalt coverage! This was obviously a claim that wasn’t going to be settled privately especially when two torched cars and some serious repaving were involved. So every year when we get our automobile insurance bill, I have to wonder: are we still paying for that parking lot?